My workmate pops her head through the door and says to me “A parcel has arrived for you.” Then adding, with a confused, (but not really surprised) expression “It looks like a pig!” Not knowing what to expect I wander over to the front door and sure enough there is a pig shaped object wrapped in black plastic. 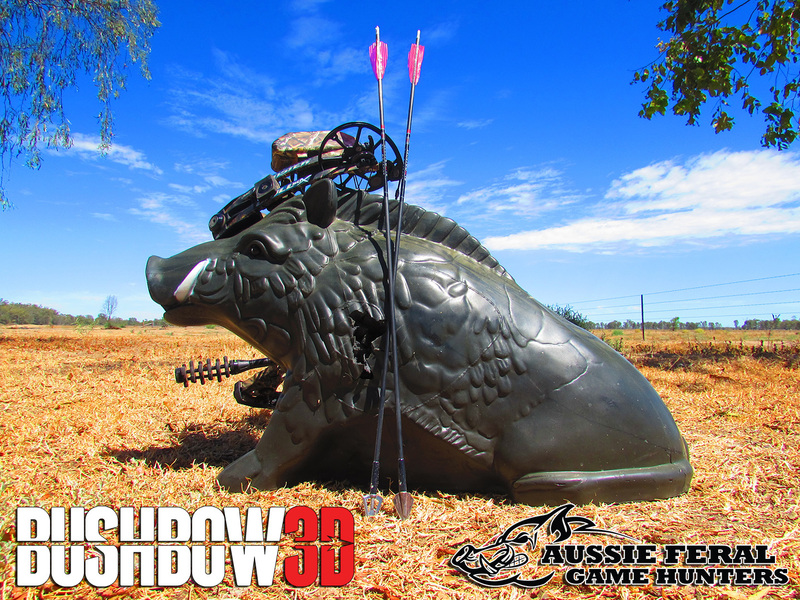 It is the new ‘Rising Boar’ target kindly sent from Gavin Mathews at Bushbow 3D targets. 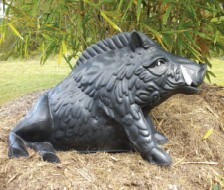 The parcel man asks if I would kindly unwrap it in his presence so he can get a photo for the guys back at the depot who had been intrigued by this strange parcel all morning, So I do so, to reveal a dark tusky, boar, positioned as if getting up from an afternoon nap. I lament that this is fitting, as I had recently missed a shot on a Cape York hog in this same position, and I would no longer have any excuses for doing the same! The beauty of this position is that it allows the target to be presented with a flat base, resulting in a sturdier target with no target wobble or shifting, than would be if it were standing on four legs. Positioning the target on my shooting range, I find it is a good weight, heavy enough not to move and twist during shooting, but not cumbersome to transport. At 82cm long and 45cm high it is a good lifelike size, and my bull mastiff obviously agrees as he observes it with interest but thankfully decides against latching onto it’s ear. The target is made from high quality self-healing foam, designed for broad-heads and field tips. The target has an effective arrow stop with both. Shooting from a 48lb bow at 20 yards, the arrow arrests with 20cm of penetration. Essentially, this gives the target 2 shooting faces. Because there is no pass through in any of my 100 shots with broadheads or field tips, the kill zone remains untouched on the opposite side. The kill zone is not visible from further than 10 yards, but that suits my needs for replicating real shooting situations. The zone can easily be painted on if desired. I pull out the lubricated arrows fairly easily. The shots taken without lubricant are still easy to remove, but the degree of such is altered by the style of broadhead used. The bevelled style single bladed broadheads such as Strickland Helix and Northern Little Evil take a little more convincing, and typical of this style require a tactical twisting motion, however this is the case when shooting them into any target. The symmetrical style broadheads remove easily, and are more forgiving on the target, and the wound heals effectively even after a number of shots. 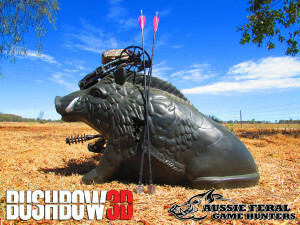 This target is the perfect training aid for those heading out on their first trip to reduce “Boar fever” of the experienced bow hunter honing their skills.